As a door and hardware expert witness and forensic consultant, I have been retained on many cases where installed panic hardware has been the source and cause of severe bodily injuries. As a hands-on contractor and installer, I have personally installed and serviced thousands of panic devices, and I have experienced, evaluated and resolved problems that arise with these pieces of specialty hardware. The three most common problems that I have witnessed in panic hardware door related injuries are (1) Improper installation (2) Poor maintenance (3) Placement of inappropriate secondary locks. Panic hardware is a door component that was designed to allow fast and unencumbered exit from a doorway. Panic hardware is typically found on hallway doors where fire requirements compartmentalize and separate areas to aid in the smoke, fire or heat control of a commercial building, hotel, or hospital. They are also commonly found on the exit doors of most high traffic or high density buildings such as movie theatres, large arena complexes, or restaurants. Panic hardware is appropriate almost any place where fast evacuation from a building may be the difference between life and death of the occupants (Life Safety). The most important aspect of all panic devices is that no special knowledge is required to use them. 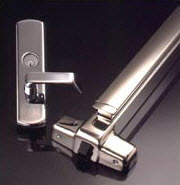 You simply push a rod, a bar or other activator, the latch mechanism is retracted and you are able to push the door open. These types of devices function differently than a typical door lock, in that they are designed to allow exit without the use of a key or any rotary motion of any kind. They are usually installed in the path of travel toward the exit of a building or controlled corridor. These devices are supposed to be equally suitable for the usage of handicapped (ADA Compliant) or able bodied individuals. There have been changes made to panic devices over the years to improve the ease of use for ADA compliance and improve the overall safety of the general public. Early panic devices were originally designed utilizing a horizontal pipe or flat bar attached to the door. 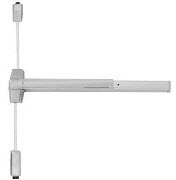 A pair of arms that pivot on base plates at each side of the pipe or bar allow the panic device to operate and activate a latch retractor mechanism when pushed. While these devices function when properly maintained, there have been a number of injury claims relating to the malfunction of this style of door panic hardware. Poorly maintained and incorrectly replaced hardware of this style has been the cause of severe injuries in several cases where I have been retained as a door hardware expert witness. These early devices can still be seen in many facilities across the country, and many are in good working order and maintained properly. If all of the components of this panic device are properly adjusted, well lubricated and securely attached to the door, the device will still pass the inspection requirements of most life safety checks. A more modern style panic device is commonly referred to as a "Crash-Bar". This piece of hardware is generally made up of a flat integral component that when pushed against, retracts a latch mechanism. Similar to the older style device employing the pipe or bar in function, the newer style crash bar is easier to push, and is generally more resistant to obstructive issues, and functions with fewer moving elements on the exterior of the device. There are several options for the exterior side (pull side) of a door equipped with a panic device. In one instance, the panic device can be used as an exit only. There will typically be no reentry through this doorway. Some exit only doors will also have a keyed lock cylinder on the exterior side of the door that would retract the latch mechanism when the key is turned. This allows an authorized user to open the door from the exterior side of the opening. A second option for the exterior trim is the installation of a moveable handle or a handle with a keyed lock cylinder. Reentry is possible with both of these components, either by moving the lever or knob, or using a key when needed. In some more sophisticated installations, a card key reader or push button entry code reader could be used to retract the latching mechanism. Many higher security options are available, as the use dictates. In every case for exterior access, the function of all of the above reentry options are basically the same; They are all used to retract the latching mechanism of the panic device in some way, allowing entry from the pull side of the door. Another common feature of many panic devices is the ability to "dog-down" ( hold open or restrain the device from latching). This feature can be used when a panic device is in an area that needs to remain unlatched, such as in a doorway of a restaurant or store where the fire code requires that the premises remains unlocked during normal business hours. In a cross corridor situation panic devices are often installed in pairs. These devices, in conjunction with special rated fire doors and other hardware components are installed to attempt to stop and compartmentalize fires. This type of panic device relies upon vertical rods to hold the doors closed when high pressure from a fire builds up behind a door. 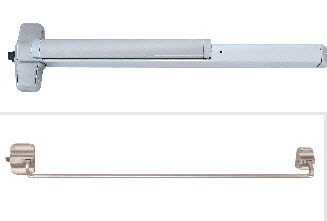 Vertical rods can be surface mounted or completely concealed within a door. In some applications both a top and bottom vertical rod is attached to a latch mechanism that integrates with a strike plate or cup within the header of a doorframe and floor. In other installations, the top rod is all that is currently required. Installation of these devices normally includes a lever or knob on the pull side of a door to allow reentry. As described above, there are a variety of options for entering an area secured by a panic device from the pull side. Depending upon the conditions of the installation, panic devices can be installed individually or work in pairs. They can be fire rated or unrated. 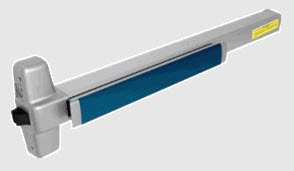 They can work as one way exit devices or allow reentry using a variety of hardware and components that allow access from the pull side of the doorway. Some panic devices are activated electronically, have built in delay circuitry, and are capable of being integrated into sophisticated monitored alarm and access systems. The most basic device is a stand-alone piece of hardware that provides egress only. When panic hardware is improperly installed, or has been damaged by abuse or poor maintenance, the effectiveness of its intended function cannot be assured. Panic hardware that is improperly positioned or incorrectly installed can fail as a result of mechanical impairment. Misalignment of latching components can be the cause of panic device failure. In this case, the panic hardware will not properly secure the door to protect against the smoke, fire or other adverse conditions that the cross corridor opening was designed to protect. Alternatively, devices that were improperly positioned can also fail by not releasing to allow the unrestricted egress as required from an area, possibly trapping someone inside a dangerous zone. When improper maintenance has occurred, components that need reworking or replacing are often bypassed, substituted or eliminated from a device. In some cases, protrusions from inappropriate replacement parts have lead to bodily harm such as severe cuts, bruising and in rare cases amputation of body parts. The above conditions have been observed multiple times where over sized bolts or screws were installed instead of the required part. Cover plates and end caps become damaged and sharp, and are often removed exposing interior components that can create injuries as well. Any secondary lock that is added to a panic hardware equipped door can render the usage of that hardware completely ineffective. If the door has been barred using a mechanical barrier or chain, the door will also be unable to open using the panic hardware. In some areas where theft is of concern, sonic alarmed panic devices have been installed with a delay egress feature. Store owners or managers finding that the alarm cannot be heard or detected soon enough have chained or positioned obstructions in front of these door to attempt to stop the possibility of theft through these exits. This obstructing or barring of the egress is life threatening and often non compliant with fire codes. Most, if not all commercial buildings are regularly evaluated for life safety and fire code compliance. When a store owner or manager makes the decision to obstruct or close off a required point of egress, the store can become directly responsible for compromising the safety of the public. While frequent thorough inspections of site conditions in every facility is prudent, many facilities opt to not budget these inspections, and maintenance is often deferred. This improper deferred maintenance has led to severe injuries creating lawsuits that could have been easily avoided. When the general public is using a building it is of the utmost importance that competent and trained hardware professionals be consulted and employed to assure the ownership of the property that all systems and hardware are functioning to the highest standards that are attainable. Being "Penny wise and pound foolish" exposes many property owners to costly legal actions.